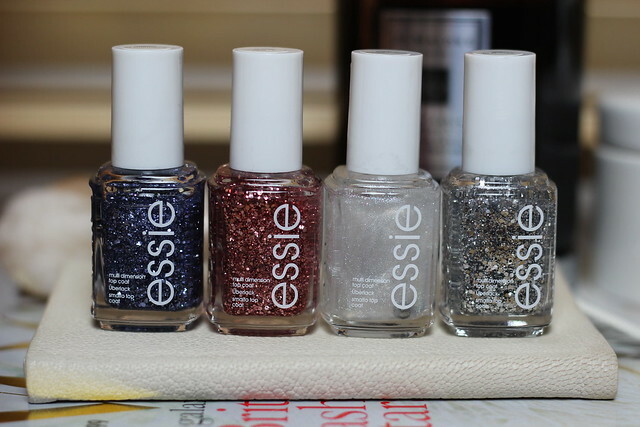 Ah Essie, how do I love thee… yes Essie is one of those brands that has had my heart for a while and no doubt will continue to do so if it brings out sparkly little gems like this in the future. This is the Essie Luxe Effects Collection that I actually believe may have been out in the US a year or so ago, but has now hit the shelves over here for us lucky beauty lovers in the UK. This post takes a look at four of the shades from the collection (the gold shade is not shown) but let’s take a closer look at the sparkly goodness! Left to right we have: Stroke of Brilliance, A Cut Above, Pure Pearlfection and Set in Stones. Covering all your shiny-fingered needs. Stroke of Brilliance is a chunky blue glitter – a very pretty blue too. Not too dark, not too bright. In some lights this shade as a slight lilac tint to it. This glitter is a clear base so would work best over a creamy colour – either a pale shade to make the chunks stand out or maybe another blue to give it some pop. A Cut Above is a chunky pink glitter – and not just typical Barbie pink, but a sort of smokey/muted pink that’s girly without being over the top. Very pretty shade and would look lovely over a grey cream or a similar shade of pink cream. Pure Pearlfection is as the name suggest, an iridescent pearly shimmer that will add a pretty, subtle dusting of sheen to any colour. This is the most universal and I think will work over most other colours. Set in Stones is the most bling of these four, a chunky silver glitter with the most obvious metallic sparkle (the other colours are slightly muted so tone it down a little) this is the one I’ll be teaming with a silver and black sequin dress for a Christmas party… the more sparkle the better I say! My top picks from the collection are Stroke of Brilliance and A Cut Above as I love the muted colour/chunky sparkle combo! Which is your favourite of these shades? So pretty, I love these nail varnishes, I hope they are in my boots! These are so pretty, will have to grab myself one or two of these. Gorgeous aren’t they – do you have a favourite! ?